While this is only one survey this is a survey conducted after President Trump declared war on NFL protesters in Alabama last Friday night, and if this poll is any indication, that war is already over. This crystallizes, as Daniel Flynn noted on the sports page a few days ago, just how well Donald Trump has chosen his enemies. 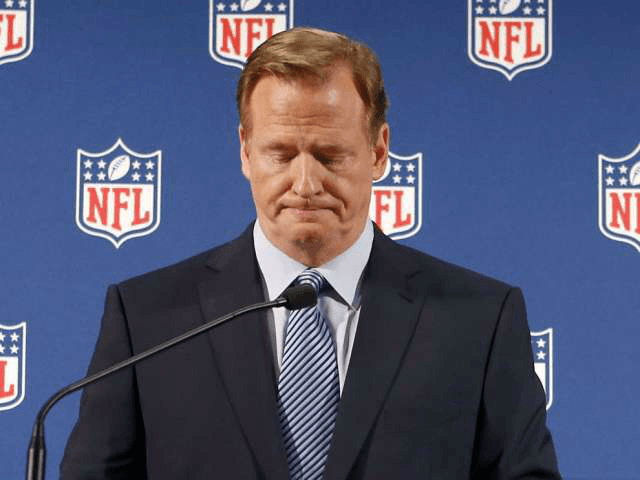 In picking a fight with the NFL, headed-up by Roger Goodell, Trump pits himself against people that the public essentially loathes. Making it next to impossible for him to come out the loser in any kind of PR conflict. While President Trump may have his difficulties from time-to-time, he is infinitely more popular than the people he’s criticizing. Q4: Now, just thinking about this year, have you watched more football or less football compared to previous years? Q5: Why would you say you are watching less football this year? Q6: Do you think NFL players should stand and be respectful during the national anthem? Q9: Do you support protesting during the national anthem at the beginning of NFL games, or is there a more appropriate place for players to protest? Q10: In the future, would you prefer to see more politics, less politics, or the same amount of politics during sporting events? Republicans and Non-Partisans have been cutting back on watching football at a higher rate than Democrats, as 66% of Republicans say they have watched less football this year compared to 33% of Democrats. Among Non-Partisans, 55% reported they have watched less football this year compared to the past. The macro numbers in this are bad, of course, with a majority saying they’ve watched less football. However, one would think that with the NFL’s embrace of left-wing politics, that they would at least gain some Democrats while losing Republicans and Indies. Clearly, that is not the case. It turns out even a significant portion of Democrats are turned off by what they’re watching on Sunday. Again, this is one survey, others will have to come out showing similar things in order to draw long-lasting conclusions. However, if these numbers are accurate, the heavyweight bout between the leader of the free world and the richest sport in the land, is a first-round, one-punch knockout.